Bake up your favorite cinnamon bun in a cookie. 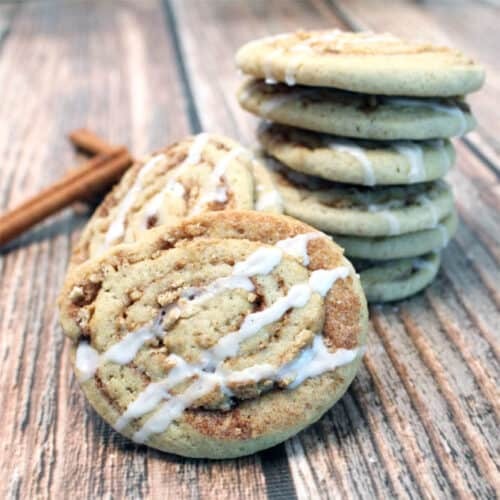 These Cinnamon Crunch Cookies are crunchy, sweet and simply irresistible! In an electric mixer, beat butter and sugar until smooth & creamy, approximately 4 minutes. Turn down mixer and beat in eggs and vanilla. Continue beating until well mixed. In a medium bowl, combine remaining dry ingredients. Add slowly to butter mixture until well incorporated. Shape into 2 logs, wrap in plastic wrap scattered with a bit of flour, place in refrigerator to firm up, about 4 hours or overnight. Crush cereal by placing in gallon sized ziploc bag and rolling with rolling pin. You want it to be crumbly. Whisk egg white & water together until frothy. Now you are ready to assemble. Remove one log from refrigerator and roll into a large rectangle, about 1/4" thick. Brush top with half of egg white mixture. Sprinkle with half of cinnamon-sugar mixture then sprinkle with half of crushed cereal. Roll up jelly roll fashion in a tight roll and place on newly floured plastic wrap and return to refrigerator for at least 2 hours. Repeat with remaining log. When ready to bake, preheat oven to 375 degrees. Line cookie sheets with parchment paper or silpat. Remove 1 log from refrigerator and cut into 1/4" slices. Place on prepared cookie sheets. Remove from oven and let cool on cookie sheet for 5 minutes then lift off with spatula and place on wire rack to finish cooling. When cookies are cool, prepare glaze. Mix all ingredients for glaze. Whisk until smooth. You can control the thickness of the glaze by adding more or less sugar. Place in a plastic bag and make a small cut in corner or use an OXO Decoratoring Kit with small tip. Squeeze icing out in rows across cookies or swirl to make a iced top. Prep time does not include chill time between stages.